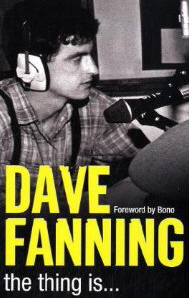 The very mention of the name Dave Fanning, and instantly we all think of U2; Ireland’s cross between John Peel and Barry Norman; and a man that asks 10 questions in the same time others would ask one. Well that’s most people’s perception of one of Ireland’s most DJs, but ‘The Thing Is’ will reveal that Dave Fanning is just like any other guy growing up in Ireland in the 60s, a man who couldn’t live without music, and who feels he’s being very lucky in his career. This book is a fascinating read from the start. Dave is honest from the off, admitting to reading Enid Blyton novels, including Bunty and Judy, using plagiarism to win competitions in some of his favourite comics, purchasing Neil Sedaka singles and even trying to convince his teacher that they should have the day off school following the death of Brian Jones. If his first single purchase didn’t do his credibility any good, he rectified that with his first album, a Beatles album no less. Throughout the book he constantly goes back to how much he loves them, and made sure he interviewed Paul, Ringo and George Martin amongst others during his career, even getting Paul to sign one of his NME charts he’d cut out from the magazine. We discover that Dave was into radio from an early age, taping songs from Radio Luxembourg at 1am in the morning like ‘Imagine’ and playing them back to his friends the next day. Rather than go on to College, just like his heroes the Beatles, he headed to work in Germany during the summer months (where he would lose his virginity to an American girl that he can’t even remember her name). But even then, Fanning wasn’t stupid. Signing up to various music clubs, he received for a fiver his favourite 10 albums from each of them, and was well back in Dublin by the time he was due to order his next full price album. “100 new albums for the pricely sum of €25” as he said. If the Beatles were his favourite group, then Dylan was his favourite solo artist. Even back in 1976 with little or no money to his name he took the boat to Holyhead and a train to London to see him. He even bought a tout ticket for the following night's performance also and stayed on. Determined to get into the music business he became editor of Scene magazine (and had Eddie Jordan among its contributors, who chased Dave for years for an unpaid Steely Dan review). There is so much to read here. There’s the Ramones request for him at one of their gigs, the guy who fooled him into thinking he was a member of Dire Straits, his surprise 35th birthday party present from Paul McGuiness. Indeed it was Dave who gave U2 some vital early breaks. On this point he is however very modest, but only for him U2 may never have got the break they needed. It is clear that another band he would have loved to have seen breakout internationally was Stars of Heaven, one of the thousands of bands whose demos he played (he said he was even given demo tapes while up the Eiffel Tower). His love of his family shines through, from his own mother and father to his wife Ursula and his 3 children; he’d happily give it all up for them. The latter chapters in the book touch on the movie side of his career, and all the Hollywood stars he has met. He’s not shy in telling us who he likes or dislikes, and what musician he reckoned “was a bit of a w**ker”. His claim to fame may be discovering U2, but there are numerous others he can add to his bow: Asking Rod Stewart if he ever uttered the wrong name in intimate moments; having Joe Elliott and Elvis Costello at his wedding; having the casting vote on the Mercury Music prize, and being bought a drink by Mick Jagger (or so he thought). I’ve met Dave on several occasions over the years (even once for dinner in L.A.) and I’ve always found him to be down to earth, completely knowledgeable, and not thinking of himself as anything more that a guy doing his job, with a little bit of luck thrown in. Fanning's book is indeed Fab.